Each week there are certain topics that keep fantasy football owners guessing. It could be how snap counts will shake out or injury status, but the effect on lineups is major. For week 7, I'll address 5 burning questions facing fantasy football teams. Is Orleans Darkwa Worth Starting? Last week Darkwa turned in a shocking performance. Normally when someone says this about a Giants running back it is because they have set a new standard for futility. In this case, Darkwa put up 130 total yards on a very tough Broncos defense. He is averaging 6.4 yards per carry over the last two weeks and the Giants would be foolish not to feature him again. The opponent is tough again, as the Seahawks come to town for week 7. It is never a good idea to count on a Giants running back these days, but Darkwa has looked special lately. I would be fine with starting him at the flex with bye weeks in progress. How Should The Titans Backfield Be Handled? DeMarco Murray and Derrick Henry are both immensely talented runners. They are also both embroiled in a time share that kills both of their values. This week, the Titans have a great matchup with the Browns and their flimsy defense. It would normally be a great spot for a running back, but not in this case. Or is it? Murray is nursing a hamstring injury and has not been participating in practice. After the week 7 tilt with Cleveland, Tennessee has their bye week. It would stand to reason that Coach Mularkey may choose to rest Murray and try to get his hamstring right coming out of the bye. Derrick Henry could be a GREAT start if Murray stays on the bench. The time share will be in place going forward, but for one week Henry looks like he may have RB1 upside. Which Fill-In/New Starter Quarterback Is The Best Start? Several quarterbacks are out with injuries and the bye week blues are real. Given the lack of proven options, many people will have to choose between one of these placeholders for at least a week. For the sake of this question, we'll say the options are Brett Hundley, C.J. Beahard and probably Ryan Fitzpatrick. Brett Hundley GB-I like Hundley's prospects best ROS, but for week 7 I'm staying away. The Saints defense looks invigorated and I think that the youngster will commit some turnovers. Smart money is on the Pack trying to ride the run game here. This former Iowa Hawkeye is ready to bring you some garbage time goodness in week 7.
much through the air. Tampa has big time weapons on offense, but this is not the week to rely on them. I'm thinking about 220 yards a score and at least two picks if Fitz starts. C.J. 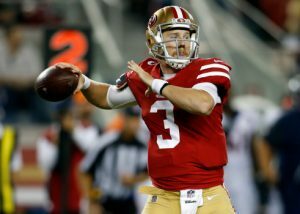 Beathard SF-For week 7, Beathard is my favorite play. He is in the weakest offense out of these three options, but he faces the weakest defense as well. It is likely that Dallas is going to go up big early in this game. That will leave Beathard slinging the ball against a defense that can be beaten. There will probably be a couple of turnovers peppered in and the Niners are going to lose. Still, I think that Beathard is going to be good for about 20 fantasy points. Will A Struggling Star WR Break Through This Week? Since Amari Cooper went absolutely bananas on Thursday night, we'll cut him out of this equation. There are still some other big names that have done plenty of shut up and not much put up. Will week 7 be when they get back to their playmaking ways? Sammy Watkins LAR: I do not like his chances. He is likely to draw the attention of Patrick Peterson, the only serviceable player in the Cards secondary. The Rams have gone away from Watkins since his dominating performance in week 3. While I think that better days are ahead, those days will not start until after the bye. Martavis Bryant PIT: Another disappointing showing is on the way for Bryant. He is facing a team that allows the fourth fewest yards to receivers. On top of that, his quarterback appears to have lost something from his deep ball. The Steelers are likely to ride LeVeon Bell and Antonio Brown in this one (and why wouldn't they). Bryant is an afterthought at the moment and that may be the story of the season. The weak Pats defense will have no answer for Julio Jones this week. situation, I would be shocked if Pryor did not see a decrease in playing time going forward. He is not startle barring a major change. 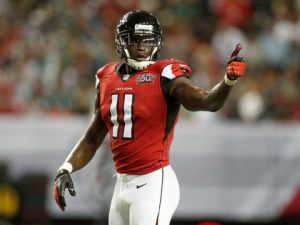 Julio Jones ATL: If you want to see a top notch receiver get off the schnide, Jones is your huckleberry. The Falcons get a matchup with the slump-busting Patriots defense this week and things will be set right. The defense in New England is a punch line right now. Even if they dedicate extra resources to stopping Jones, it will probably not be enough. If he cannot produce in this situation, feel free to panic. Will The Adrian Peterson Comeback Tour Continue? In a word, yes. Peterson was an awful fit in the Saints offense. He is a back that thrives on volume and the Cardinals will give him that. His presence is opening things up in the passing game. The more effective passing game is opening things back up for Peterson in return. It is a sort of chicken vs. egg situation where the end result is a much more dangerous offense. John Brown's improving health is one more factor in favor of all Cardinals offensive personnel. The Rams defense has some talented personnel, but I'm expecting big things from Peterson and the Cardinals. For those that waited out the Saints debacle, the rewards will be real until David Johnson comes back. If there are questions that you would like answered in a future column, feel free to leave them in the comments. Alternatively, check us out on Twitter: @_knuckleheads and @brendancole16. More exclusive content is always on the way, so check back often.